In this age of widely publicized business scandals, it helps to take another look at the values that sustain business leadership. There are innumerable examples of people who managed to build great businesses without delving deep into the process of leadership training. An important contribution can be found in the history of the Society of Jesus, quite possibly the largest and most ancient “enterprise” in the world. 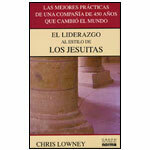 In his book, “Heroic Leadership: Best Practices from a 450-Year-Old Company That Changed the World,” recently published in a Spanish-language edition, Chris Lowney reveals the principles that have enabled Jesuit leaders to run one of the world’s longest surviving, most innovative and most global religious institutions over the course of 450 years. Lowney is an ex-priest and executive of the JPMorgan investment bank. In 1983, Lowney left the Society of Jesus and began a new carrier at JPMorgan. He spent 17 years at that firm as managing director and board member in New York, Tokyo, Singapore and London. His ability to see things from two points of view – both man of faith and knowledgeable business executive – enabled him to lay out the complete story of how, back in the 16th century, 10 men without any funding and no business plan established one of the world’s longest-surviving, most innovative and most global religious institutions. Today, the Society of Jesus comprises 21,000 professional staff members, running some 2,000 institutions in more than one hundred companies. Among the more prominent graduates of its educational system are Bill Clinton, Francois Mitterrand, Antonin Scalia and Fidel Castro. Why have the Jesuits prospered? Why do they continue to prosper? That is the key question the author, currently a consultant to the Catholic Medical Mission Board in New York, tries to answer. According to Lowney, the Jesuits abandoned an ostentatious style of leadership and focused instead on the four values that are the real substance of leadership: Self-awareness, ingenuity, love and heroism. Ignatius of Loyola and his followers trained their students so that they could win. They trained leaders who “understood their strengths, their weaknesses and their values, and had a vision of the world; embraced change and adapted themselves to a changing world; treated others with love and with a positive attitude; and strengthened themselves by providing them with heroic ambitions,” Lowney writes. Lowney admits that Jesuits are not generally perceived as experts in leadership, either by the public or in business literature. Books on leadership usually focus on Attila the Hun, who managed to unite many dispersed tribes, and launched the attack that destroyed Europe, in around 440 A.D. Or they focus on Niccolo Machiavelli, a contemporary of Loyola, who has been extolled in a half-dozen books on leadership. In contrast, Lowney argues that the methods of the “Society,” along with its vision and longevity, make it superior. “Unlike the Huns, who flourished for only a brief period, the Society of Jesus has had 450 years of success. As for Machiavelli, he managed the affairs of a great prince, while the Jesuit team used the talent of an entire group.” Moreover, unlike Attila and Machiavelli, the Jesuits did not consider deceit or assassination acceptable strategies for gaining or using influence. “‘Love’ provides purpose and passion to ingenuity and heroism,” says Lowney. It is easy to understand how a loving spirit can help the sort of organization [like the Society] that is dedicated to helping people. However, Lowney also believes that love makes every sort of company stronger. “Love enables any company to welcome every sort of talent, irrespective of religion, race, social position or credentials. Love is the joy of seeing team members succeed.” Leaders motivated by love start from the premise that people will give their best when they work for those who provide genuine support and affection. How Does One Perform a Leadership Role? According to Lowney, performing a leadership role involves appreciating one’s dignity and potential, recognizing the weaknesses and attachments that block fulfillment of human potential, expressing underlying values, fixing personal goals and forming a world view. That means realizing where you are, what are you looking for and how are you treating others. It also involves the wisdom and value of examining your conscience and getting into the habit of reflecting every day, so you can re-focus priorities and derive lessons from successes and failures.